In a perfect world, I'd find a way to do this crafting stuff full time. I'd have a screen print machine, a die cut machine, a heat press, know how to be a master sewer, and have some more knowledge of how to use Illustrator. I'd go back in time, and take the art classes I should have ages ago. I know there is always time for this, but in the mean time I have to pay the bills, so anything I start will be slow and go. So Staceys Bookstore in SF recently closed. This is terribly sad because this place had over 85 years of history in the city. Also...it was the closest bookstore to my office. However, with this place closing, they had a liquidation sale on all of their furniture, and I made out with a file cabinet and two metal paper holders, all for under $30. This file cabinet (below), retails over $15o in most places, so I got a steal! It has definitely seen better days, and I bought it with the intention of prettying it up and painting it to my liking. Sooo...how do I paint a metal file cabinet? Search on Google, and type in "How to paint a metal file cabinet," and an eHow tutorial shows up, exactly with what I am looking for. I am looking forward to tackling this project, and finding some ventilated space to spray my cabinet. I can't wait to keep you all updated on the progress. Hopefully I can get to this sooner than later. Maybe I'm just craving it, or maybe its because I know there is a ton of cute stuff tagged sushi out there on Etsy, but that is the word of the day. Sushi. Here we go. I first saw this stuff a while back, and found it to be so fun. Yes, its hand towels, but how bad would you love to get this as a gift. I honestly don't think I could bring myself to open it. 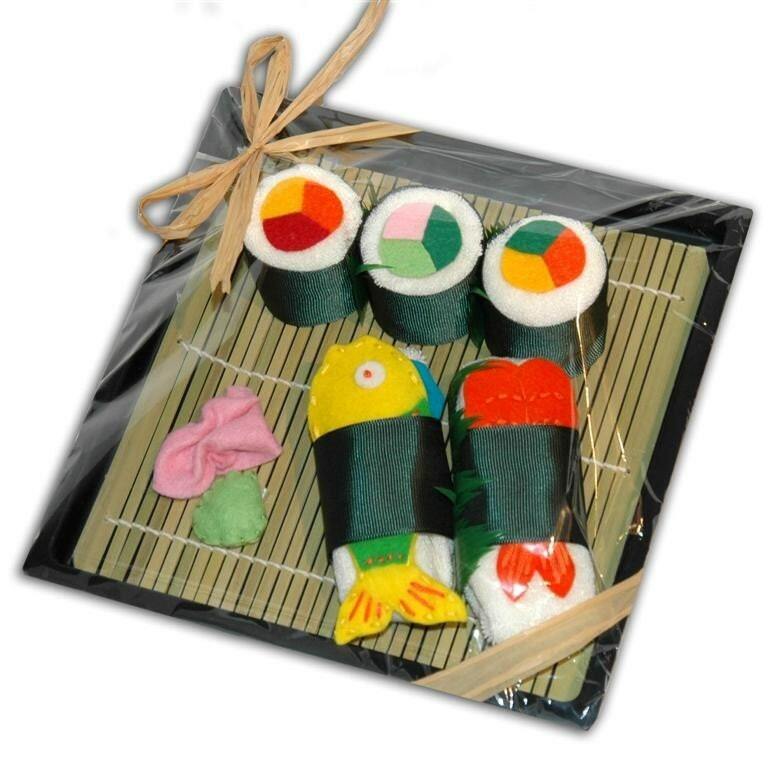 Sushi for Baby makes these practical, not edible displays of fish. I would forgo drying my hands for sure. 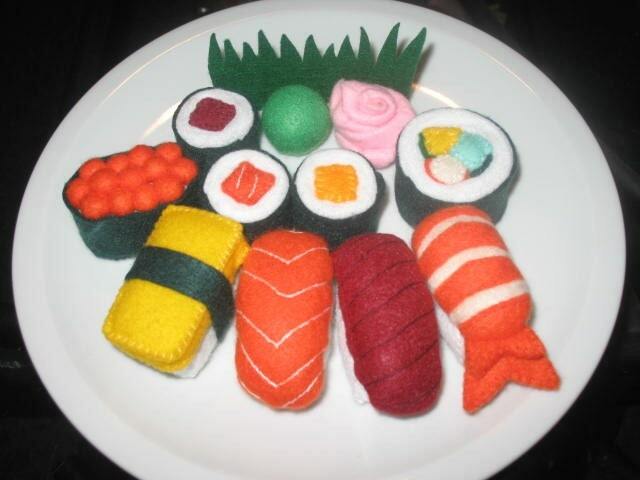 UmeCraft's gives you the PDF of the pattern, and teaches you how to make your own felted sushi pieces. I have linked to her stuff before, because its super cute, but as long as her tags continue to match my needs, I'll show you. 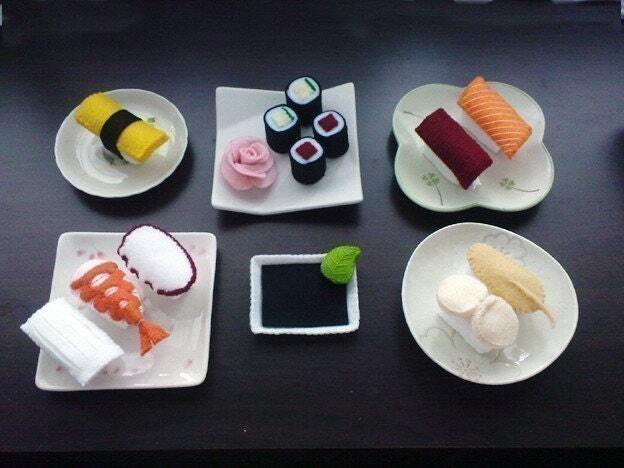 Why wouldn't you want your own felted sushi? If you are like me, and aren't in the know as to how to felt your own sushi, and you just want to buy sushi that is ready for you...Pachom has this cute set already made. This might win my favorite handmade award, only because of the tedious nature of the knitting. 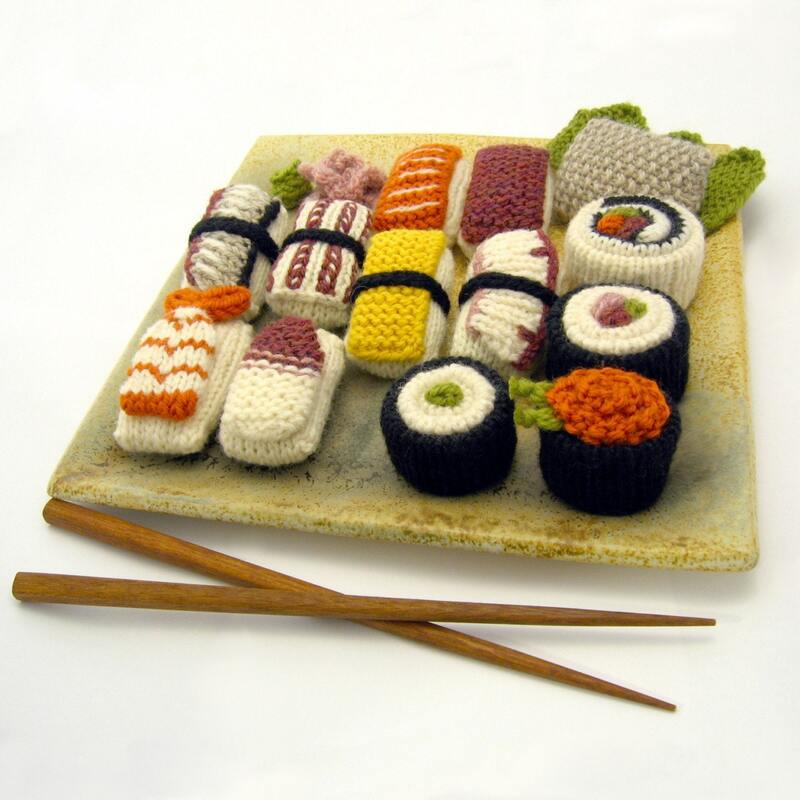 NeedleNoodle will sell you the pattern for this sushi set. AGAIN...back to the I wish I could knit category, because if the stitches are all mapped out for me, I would love to attempt this. A great pattern for the sushi lover. 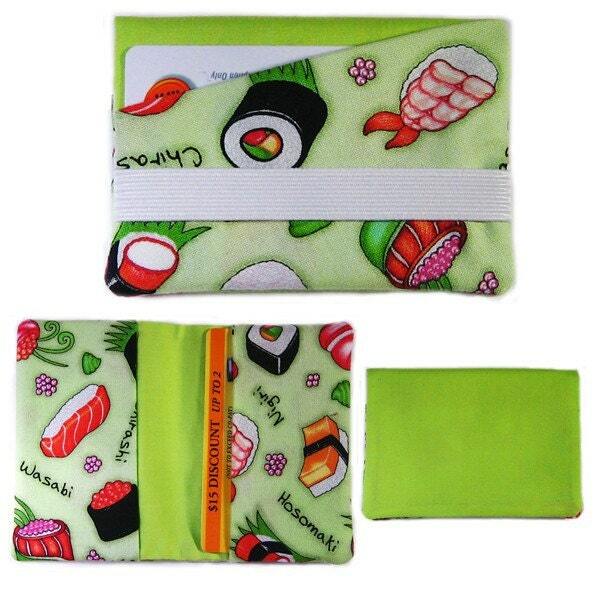 If you would like to carry your sushi with you all the time, you can use this billfold and wallet by LittlePennyLane. 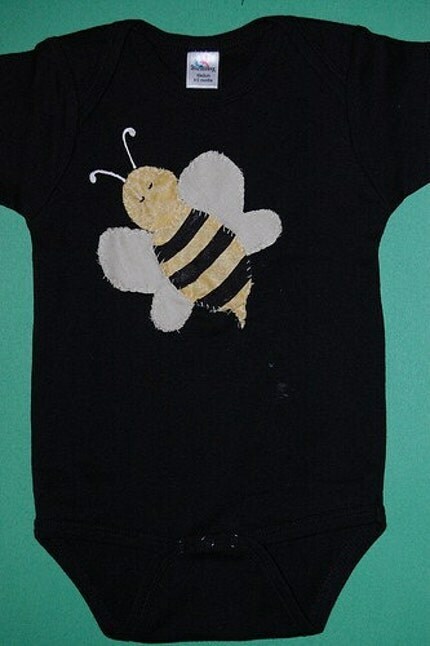 For $15 this is a bargain, and cute to boot. If sushi credit card holders aren't what you are into, she has a ton of other adorable fabrics as well. Love the cut, love the fit, love the little red pocket on the front. Definitely love the fabric. 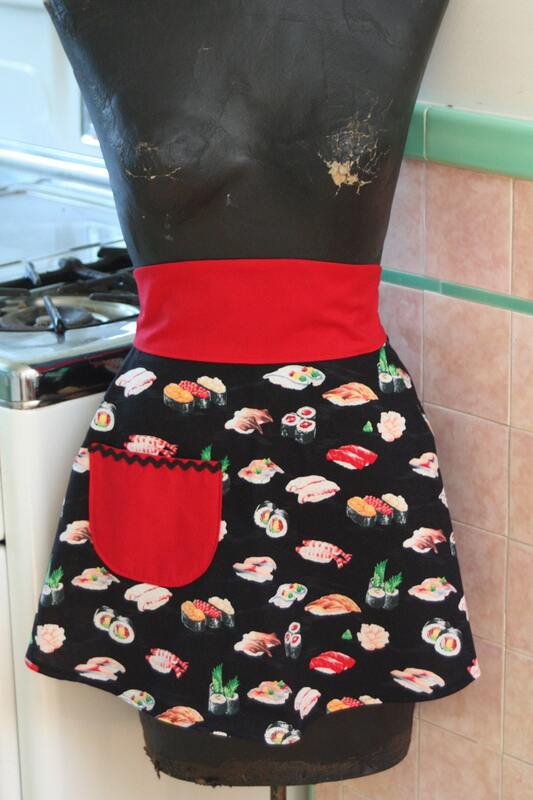 Wear this lil sushi print apron, and look adorable and fashionable in the kitchen. Pie Dough Productions has all sorts of yummy vintage fabric creations. 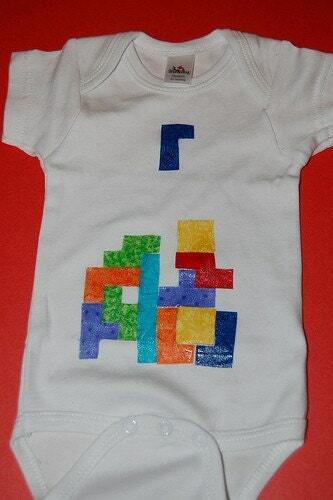 Continuing with the retro theme this weekend, I made this super cute 1-up onesie. I debated actually including the 1-up words on it, but decided that simple is better. I also made a similar tulip for my commission, and liked it so much, I added it to my store too! This past February I took an intro to sewing class. Ive always considered myself to be somewhat of a quick learner, but for the life of me I couldn't figure out how to sew. I had my mothers old machine, and I had this fear of breaking it. Even after my friend came over to teach me to use it, I used it that day, but forgot soon after. I started hand stitching fabric on my wunzees, but really wanted to figure out how to machine sew too..for more options. The problem got worse when Mick bought me a higher end sewing machine for the holidays...now i really needed to learn. Enter Stonemountain and Daughter. If you are in the Bay Area, I highly recommend it. I took a $30 intro to sewing class, and left with a pillow. They didn't give me the pillow...i made it! Nicole was great and thorough and a great teacher. I am confident now that I can actually continue sewing, and wont forget how to thread the machine. They have a great course list, so you can leave with a tote, skirt, etc. This place will be a frequent stop for me...i can feel it. In fact, when I left the class, I got a coupon for discount fabrics, and I haven't even used it yet! Nor have I truly used the skills that I learned. I get so wrapped up in the wunzees, that I forget I have a great machine sitting in the the other room! Just wanted to show you all my newest retro addition to my collection...TETRIS! So fun! This one took a bit of time for sure, and I opted to use just fabric glue instead of sewing the individual pieces on. It gives it a bit of sheen. 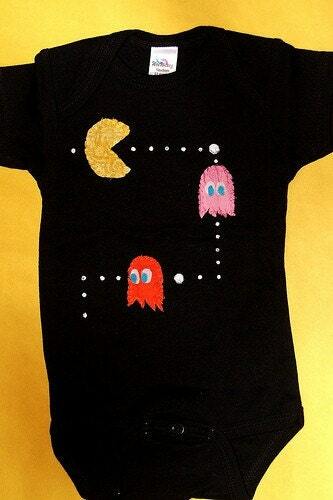 I also made my third Pacman onesie...lets see how long this one sticks around in my shop! This is one of my favorite clever blogs. They have pictures submitted with people taking pictures using their vinyl covers and incorporating themselves into the shot. Its pretty much genius. 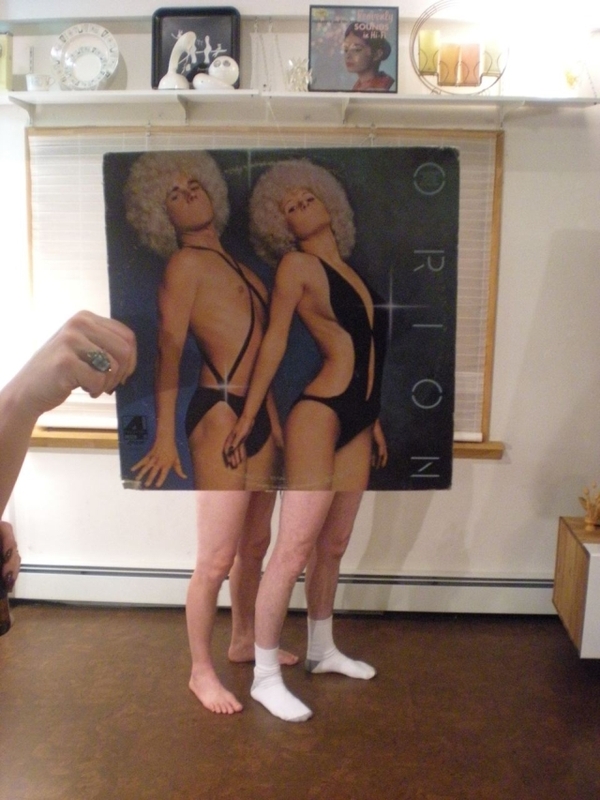 Oh Sleeveface.…another case of “why didn’t I think of that first?” This is brilliant. Here are a few, but I highly suggest checking out the whole site. Isn't it great what you can do with a little imagination? 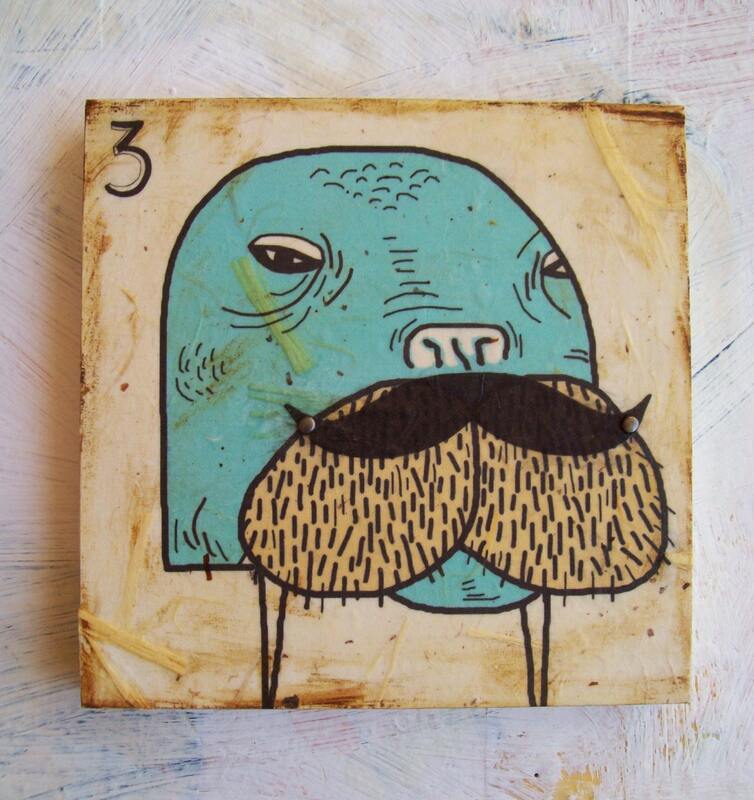 Starting with this Mr. Walter piece of fine art, measuring in at 6x6. Love the mustache, and the fact that it's an original, makes the $28 price point a steal. RetroWhale has alot of really interesting pieces. This tote bag is super cute. I love the playful nature of the walrus. It comes in multiple colors, and I'm immediately drawn to the photo just cuz the bag is filled with my favorite, the Gerber daisy. RainbowSwirlz has a ton of great screen printed items, and if you aren't into the tote, get the walrus on a shirt! The LOLrus! For all you who know the I can haz cheeseburger site, you would be familiar with this clever wordsmith. Just don't take his bukket. Icky Dog creations has other plush animals as well, but none of this fame. This might be my favorite of all my walrus finds today. If only it were bigger, I would love something like this for a cookie jar. I guess I'll just have to eat smaller cookies? MudFairy's shop is full of cute hand thrown pottery, with faces. I'm going to browse and maybe start a MudFairy collection! I love the pattern of this walrus screenprinted t-shirt. The heather grey v-neck makes it look uber comfy too. NewDuds is doing what I would love to do, and screen printing. Love their shop, and you can check out their store page on Facebook too! 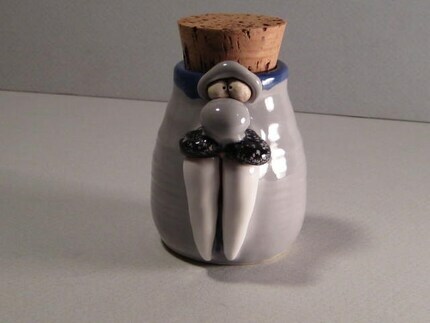 I leave you with the video of the saxamaphone playing Walrus. 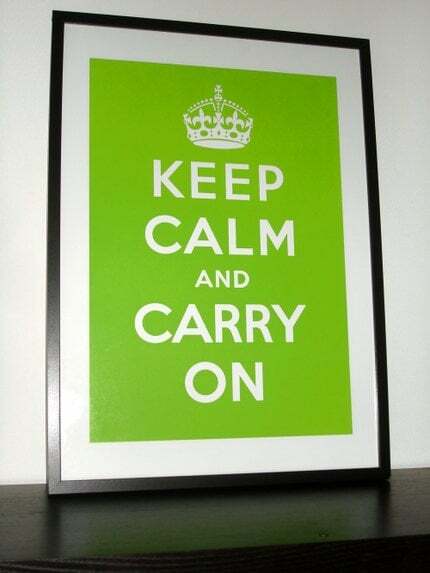 Not because I found it on Etsy. But because its awesome. Enjoy. Trina's friend Janelle made these adorable cupcakes. White frosting with red sprinkles and strawberries, where the other ones had green frosting with lady bugs on top. Emily's sister in law made this cute diaper cake. It was a three tier cake (not edible of course), surrounded with cute accessories like pacifiers, the lady bug sandals on top, and combs. With the already chosen name Sophia, the obvious nickname is Sophie, so Emily received this cute hand painted pillow. I guess the baby lays on it in the parent's lap. Adorable and functional! This was the most amazing quilt I had seen in a long time. Emily's mother had quilted this Hungry Little Caterpillar themed quilt, and you could tell a lot of talent and love were put into it. I would hope for something like this as well. 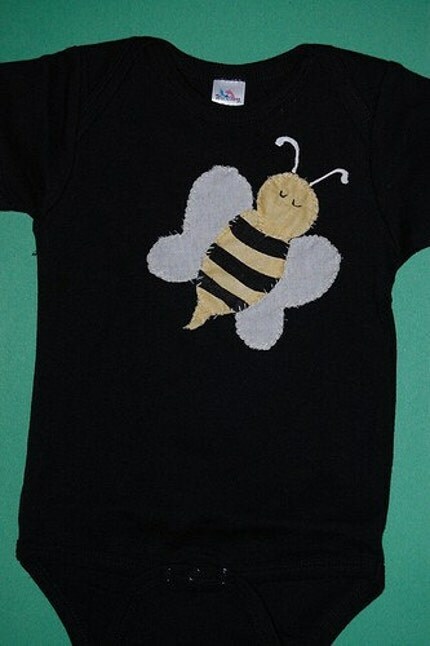 I thought it cute, especially with the recent onesie I had made in the same theme. Emily has already decided that the theme of Sophia's room will be Red, Black and White, so how appropriate that Trina painted these letters for her room. 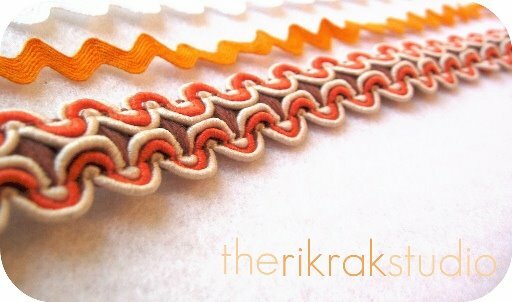 A nice splay of color, both solid and patterned, and a treasure for any child's room. Something that can grow old with her as well. Last, but certainly not least, how can I leave out the picture of Emily with the onesie I made for her. 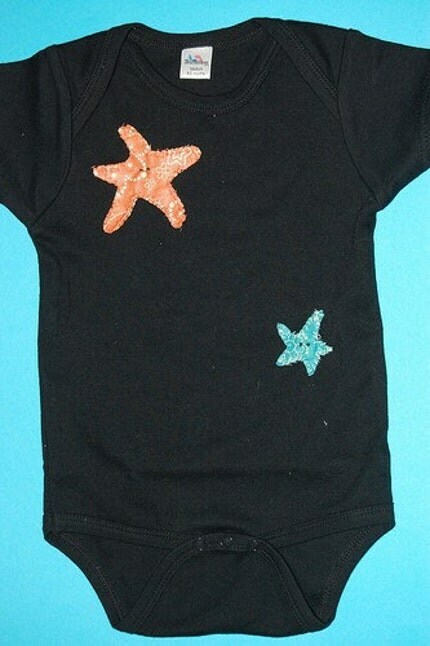 I cant wait to see the photo of baby Sophia rockin the outfit! I almost forgot I got another spotlight section on Etsy today. Its a little ironic, seeing as my inventory is currently somewhat low...but I guess the point is to just get it lower right? Buy Buy Buy! Sell Sell Sell! So here is a screenshot. Be sure to visit it in the Children's Showcase section. A little bit of color for your Friday. Chartreuse is not only beautiful, but its the most visible color to the human eye. In a great mood this morning, its Friday after all. So enjoy the pictures I know you wont miss. I get excited when I make a sale. What can I say...I have a day job, these aren't paying the rent, but I get excited. I love the idea of putting together what someone wants for them and finishing a commission like I did last night. I also love the added bonus of realizing that they bought additional wunzees that I already had in the shop! Bonus. I let many more people in my life know that I'm doing this. I sent out a mass email, dragged all my product to LA for the weekend...and guess what! I sold 4 in LA, got a commission for here, and other people interested in the shop! Yay! Looks like I have to start bulking up my in-store inventory again, and figuring other ways to intrigue the masses. Here are a few I made for the commission that included "The Starving Larve". Cute right? Yesterday was ridiculously windy. Came from nowhere, and was windy throughout the Bay Area, and probably elsewhere as well. With Summer coming faster than we realize, windy days like that make me think of kite flying, and all of the people that will be out and about with their awesome kites. I have a friend whose goal was to fly a kite, and you can see she had a tough time finding one at a decent price. eHow shows you how to make one. I have taken the instructions and included below. If and when I decide to make my own kite for a windy day as well....I'll post the pics here. 1: Cut two lengths of doweling rod, one 16 inches long and another 24 inches long. 2: Measure each cut piece with a ruler. Mark the shorter, 16-inch piece at half its length and mark the longer, 24-inch piece at a third of its length. 3: Position the two rods at right angles, one on top of the other so that the marks touch. The two rods should form a cross shape. 4: With strong, thin string, bind the two rods together where they meet. Tie a secure knot and cut off excess string. 5: Use a utility knife to cut a small notch into the ends of both rods. These notches will hold the string that gives the kite its shape. 6: Place some string in the notch at the top of the kite frame and wind it around the top of the rod. 7: When the string is well-secured at the top of the rod, draw it tightly around the edge of the frame. Make sure it fits securely into each notch in the rods. 8: When you return to the top of the frame, secure the string by tying its ends together in a tight knot. 9: Place the finished frame on top of a large piece of paper. 10: Using the kite frame as a template, cut the paper with scissors or a utility knife. Leave an excess of about 1/2 inch when cutting around the sections of string. 11: Smear glue along the outside edges of the paper and fold it over so that it encloses the string and secures itself to the paper inside the frame as well. Make sure you use enough glue and spread it evenly enough to attach the paper both to the string and itself. 12: Tie a length of string to each end of the shorter rod. The string should be a bit longer than the rod. 13: Tie another length of string to each end of the longer rod. Again, the string should be a bit longer than the rod. 14: Pick up the two strings with one hand, finding the point at the front of the kite where they overlap. Using a bit of extra string, tie them together. This is the point at which you will attach the kite string when it comes time to fly. 15: To make a tail for your kite, secure several ribbons to the bottom of the kite using strong glue. I have a showcase today on Etsy! You can find some of my listings in the Childrens showcase today for 24 hours. Yayay! Check it out. Yippee! It's kitten season, and that means that we are getting one! The hope is to pick up our new furry friend on Wednesday. We havent picked one out yet, nor have we named the kitten we haven't met, but rest assured, you will see photos of the lil one soon enough. With that being said, todays Etsy Tag Monday is appropriately: Kitten. Here goes. Again, more reasons for me to want to learn how to knit. 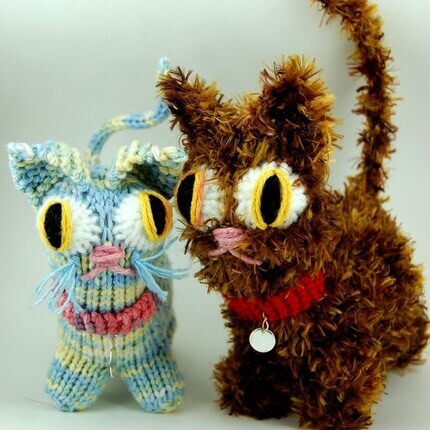 You can knit one of these Hopefull Kittens with the pattern by Cheezombie. You can find things to do with all the leftover random yarn in your collection, and get one of these cuties. 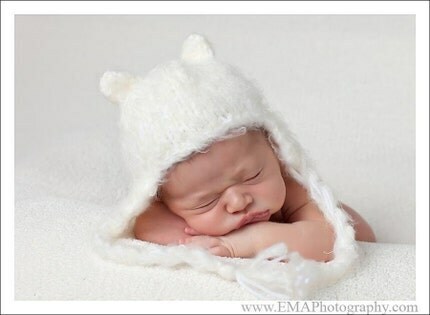 Seriously...how cute is this lil kitten hat for a newborn? 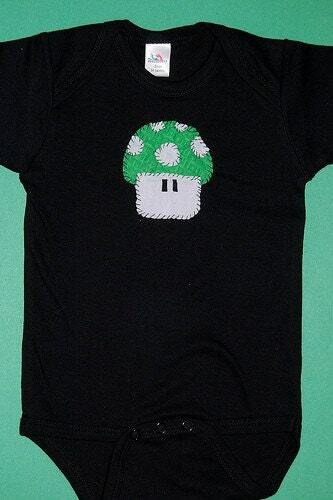 I only hope that when i start a family, people read my blog and get gift ideas. Too cute. Gem's Boutique offers this hat in a few colors as well. Hooray for sock animals. I appreciate the effort and the adorable designing in an idea that I wish I had thought of myself. This kitten is a polka dot dream, and child friendly to boot. 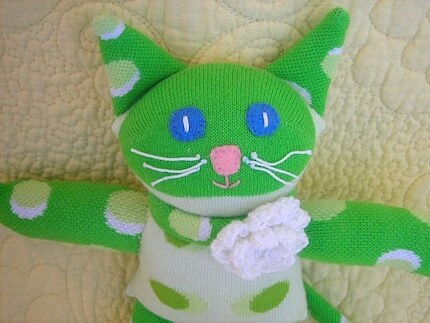 Uppity Woman Designs has quite a few other fun sock animals as well in addition to assorted knicknacks. 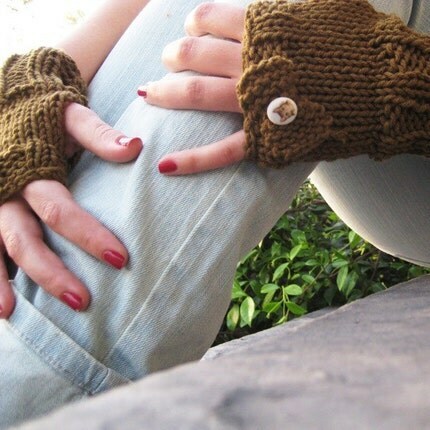 For my final Etsy find today, I went with these adorable hand warmers by KnitLush. Not everything has to be about the kids you know. With a little Beatrix Potter button accent with a Miss Moppet kitten, these are definitely something you should add to your wardrobe. I am driving down to LA for Passover today. The first night technically was Wednesday, and that is when the typical household holds their seder, but this year, my grandmother wanted to have as much family in town so we are doing it during the weekend. Passover has been a traditional family get together every year for me, even though our actual rituals get less and less traditional every year. I thought I'd post some Passover friendly stuff today. The story of Moses is Passover heavy, with him guiding the Israelis out of Egypt, so I have found this cute Cardboard Tube Moses for you to do with the kids. All recycled material, and adorable to boot. Click on the link to find the instructions. 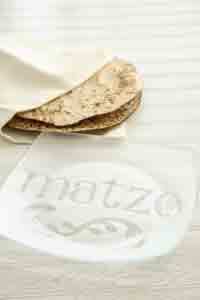 During Passover, there is always a stack of matzot on the table during the holiday meals. This etched-glass matzo tray is a beautiful holder for the matzot, though if making it with a kiddo, you probably would need to keep them supervised. You can find the directions as to how to etch this plate on number 3 on the page. In order to give the craft its proper credit, they excerpted the idea and directions from Crafting Jewish. I just found this belt buckle kitchy. 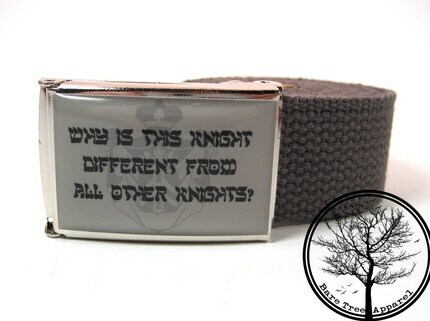 "Why Is This Knight Different From All Other Knights?" 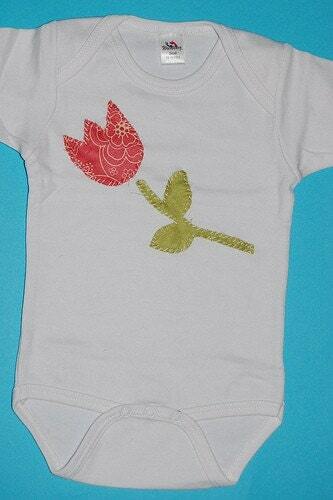 Its from BareTree's shop on Etsy. He only has two of these...just in time for Passover. can finally cut some fabric!